Rocky, chilly, wind-swept, thinly vegetated, New England's Isles of Shoals are not what you'd consider particularly hospitable chunks of land. Unless you're a tern. Well, I'm not a tern, but I do like to watch them. 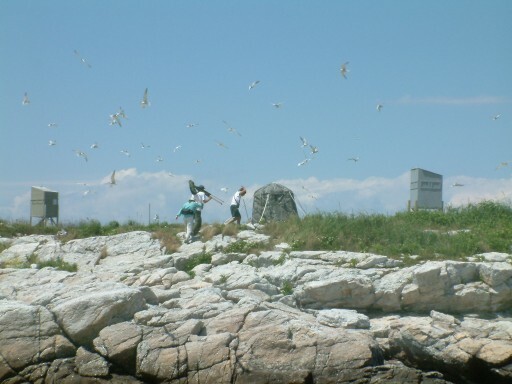 So it was that on July 30th, 2005, I was one of ten people who spent a day with the tern colony of White and Seavey Islands, courtesy of the New Hampshire Audubon Society and the New Hampshire Tern Restoration Project. We traveled out to White Island aboard the Uncle Oscar, a tour boat out of Rye Harbor. Landing was mildly interesting: there was no dock on White Island, so we were ferried from Uncle Oscar to shore in a six-man Zodiac inflatable boat. We landed at high tide, so the connection between White and Seavey was underwater. So for the first hour or so, we looked around White Island and listened to an orientation talk given by Diane De Luca and the resident tern monitors of the Tern Restoration Project. From time immemorial, the Isles of Shoals hosted large nesting colonies of terns: Common, Arctic, Roseate, perhaps others. However, by the 1950s the terns were all gone, victims of market-hunting, human pressure, and competition from Herring and Great Black-backed gulls. 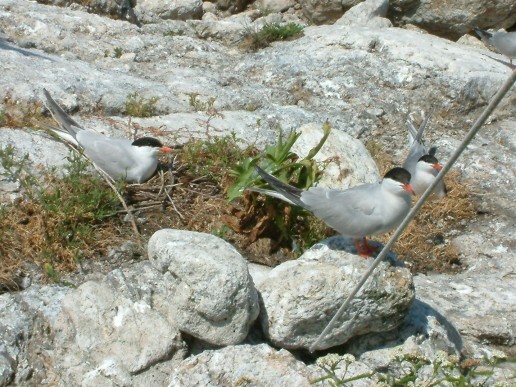 The few remaining New Hampshire terns eked out a thin survival on the mainland, where these ground-nesting birds were horribly vulnerable to predators of all kinds. 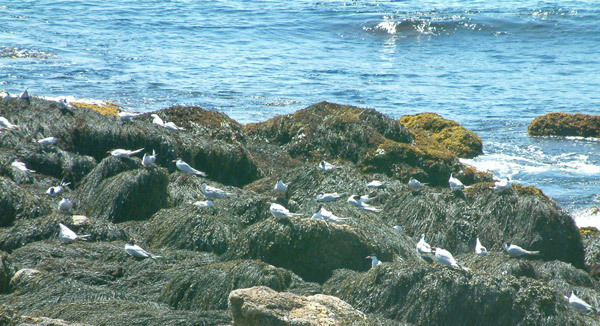 In the early 1990s, a team of dedicated people from New Hampshire Audubon and the NH Fish and Wildlife Department decided to try re-establishing a tern colony on the Isles of Shoals. For a variety of reasons they settled on Seavey Island as the best of the islands for their project. Seavey is basically a single big hunk of rock, four or five acres in area, with a thin, scattered covering of grass and small shrubs. 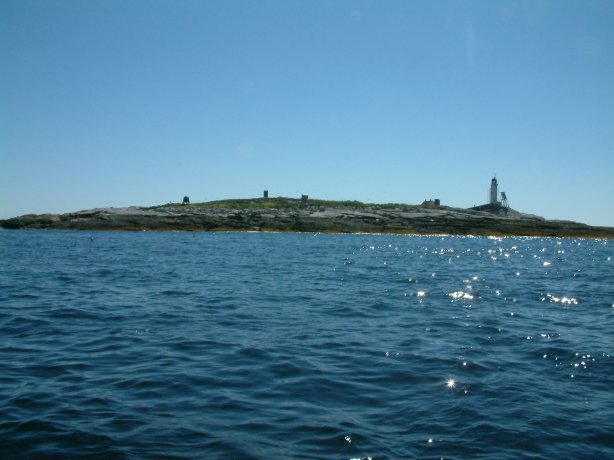 When the tide is low, Seavey is connected to White Island by a narrow strip of rocky beach. White Island is almost as inhospitable, a few acres of rock capped by the White Island Lighthouse, an 85-foot-tall tower built in 1850 and occupied today by an automated Fresnel-lens lamp and a foghorn. The old lighthouse keeper's house and shed are also still there, and make convenient (though spartan) quarters for the tern-watching biologists. White and Seavey Islands as seen from the southwest, near low tide. Seavey is in the foreground; the White Island Lighthouse is visible in the background. In spring 1997, the team set about Phase 1 of the project: driving away the gulls from Seavey Island, so returning terns could nest in peace. They also set up visual and audio decoys: models of terns and loudspeakers blasting out the sounds of an active tern colony. They expected that was all they'd be able to do that year, and that it would be at least a year or two before any terns found the island habitable and tried to move in. They were pleasantly surprised when, mere weeks after the gulls were driven away, six pairs of hardy Common Tern pioneers settled on the island and successfully raised six chicks. The new tern colony expanded rapidly: 45 pairs in 1998, 141 pairs in 1999, almost 500 in 2000. 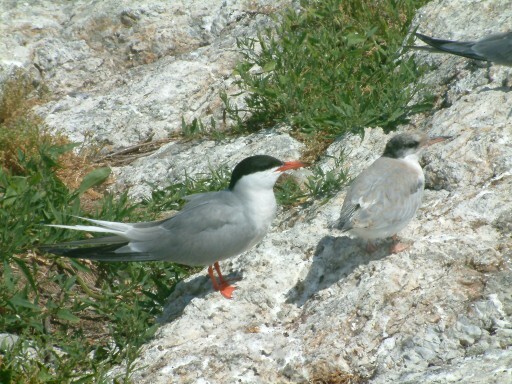 In 2001, some 800 pairs of Common Terns were joined by a single pair of Roseate Terns. It was the first time in fifty years that Roseates had nested in New Hampshire. The next year, 25 pairs of Roseates and over 1600 pairs of Commons were joined by a single pair of Arctic Terns -- again, the first time in several decades that species had nested in New Hampshire. After that the colony's growth rate leveled off; since 2005 or so, the colony has averaged 2500 pairs of Common Terns, around 60 pairs of Roseate Terns, and a dozen or so pairs of Arctic Terns. 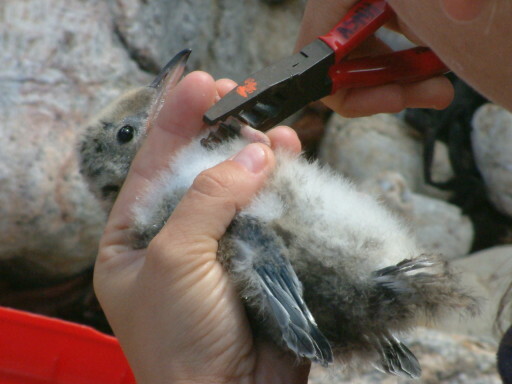 This tern chick is being banded with a standard US Fish & Wildlife Service metal leg band. The Tern Project uses bands made of a special metal alloy that is both lightweight and highly resistant to corrosion. By and by the tide receded and the connecting beach was dry enough to cross. Dan and Jennifer walked across to Seavey Island, captured three unfledged tern chicks, and brought them back across in a compartmented box. They demonstrated how they measure, weigh, and band the tern chicks, then returned the three to their nests on Seavey. After the banding demonstration, our group divided into pairs. Each pair got to spend half an hour in an observation blind on Seavey, watching the terns at their nests. The five- and six-foot-high blinds seem absurdly obvious on an island where the tallest vegetation is barely a foot tall, but they're necessary. Anything not a tern moving on Seavey arouses the terns to a fury. A huge churning cloud of birds forms within seconds, all angrily screaming at and sometimes dive-bombing the intruder. A tern's sharp bill can deliver a significant injury when it has the power of a diving tern behind it. It's genuinely dangerous to get close to the terns without some kind of cover. Tern Project leader Diane DeLuca leads birders Steve and Jane Mirick to the observation blind for their turn at tern-watching. They're all covering their heads in case the terns circling around them decide to attack. For all their exposure, though, the blinds work quite well: once you're inside the terns pretty much forget about you, and you can watch them going about their daily lives from close up. And when I say close, I mean close -- almost within arm's length. There were adults sitting on the rock, resting and preening. There were adults on nests, incubating eggs. There were adults hanging around with almost-fledged chicks. And there were a couple of small downy chicks, only a few days old, hiding under the grass except when their parents came with food. Terns eat only fish, and swallow their food whole, so it was quite a sight to see a tiny down-covered hatchling chick eating a fish almost as long as it was. 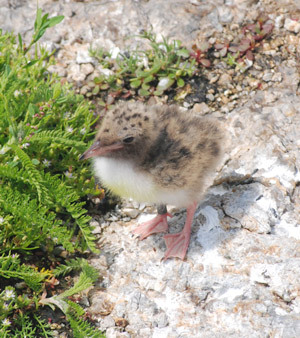 A hatchling tern chick, probably less than a week old. An adult Common Tern with a chick about four or five weeks old. This chick is either just fledged or close to fledging. Two terns on their nests near the observation blind, with a third one standing on watch. I counted at least five active nests within ten feet of the blind. We spent the rest of the time looking around White Island, watching the terns, looking at the White Island Lighthouse, and looking for other birds. Besides being home to the tern colony, White and Seavey islands are also a popular place for many kinds of shorebirds and seabirds. There are no beaches or marshes, but the islands' topography and the eight-foot tidal range result in a lot of tidepools and tide-rocks, covered at high tide but exposed at low tide, blanketed with seaweed and kelp and all the organisms that live in them. So it's popular with rocky-coast types of shorebirds. The most common were Ruddy Turnstones. They were around all day; the most we saw at once was about twenty, but it's likely there were more. Since it was late summer, their coloring was a bit faded and battered, but it was one of the best looks I've had at turnstones. There were also a couple of Spotted Sandpipers, a couple of dowitchers, and one real prize: a single Red Knot with the big flock of turnstones. It wasn't very red, more the drab gray of its winter plumage, but red or gray it was still a Red Knot, a life bird for me. We also saw a number of other birds common to the Isles in summer. Common Eiders routinely nest on the islands; we saw several adult hens accompanied by clusters of ducklings. Long-tailed Ducks are occasional visitors. Double-crested Cormorants are omnipresent, as are Herring and Great Black-backed gulls. A single Laughing Gull put in an appearance. Black Guillemots aren't unusual in the waters around the Isles; the Tern Project biologists are hoping that eventually some guillemots will also try nesting on Seavey Island, but none have as yet. But most of the time we spent watching the terns, even when we were trying to do something else. It was almost impossible to not watch the terns: adults and juveniles were everywhere, on both islands, and the air was full of their calls and cries. Only the high ground on White Island, around the lighthouse and the keeper's house, were free of them. There was a steady stream of them coming and going. There were terns squabbling over food or mates; adult tern pairs doing courtship flights or courtship feeding; adult terns feeding fledgling chicks; fledglings just roosting; fledglings practicing flying; even a few fledglings trying their own fishing skills. This year was the first time that any terns nested on White Island; however, by late July the oldest chicks have fledged and can easily manage the short flight from Seavey to White. So many of the birds on White Island were fledglings. The tide-rocks on White Island are a popular place for the terns to roost when the tide is low. Uncle Oscar returned at 3PM to take us back to the mainland. Getting out to her was a bit more of a challenge than getting ashore had been: the much lower water level meant walking out to the Zodiac over twenty yards or so of seaweed-covered tiderocks, with the last few yards in knee-deep water. Once we'd managed that, the rest of the trip back was a breeze. It was a wonderful trip, and a wonderful way to spend a day. I had seen the Seavey Island tern colony twice before, from "around the islands and back" boat-birding tours aboard Uncle Oscar. Such boat-birding trips are popular in summertime, since Seavey Island is the only place in New Hampshire, and one of only a few places in all of New England, where you can reliably see Roseate and Arctic terns. However, from now on the boat trips will seem pretty tame to me. Seeing the terns is nice, but it doesn't hold a candle to living among the terns for a day. The Isles of Shoals in general are rich in history, and White Island is no exception. The White Island Lighthouse has a long and storied past, from the first lighthouse's construction in the 1820s to the "Lighthouse Kids" of the NH seacoast and their successful project to raise enough money to save the storm-battered structure.